We talked to the designer herself, Nina Stössinger about Nordvest, and about her work as a typeface designer. Tell us the story about the Nordvest typeface. The design of Nordvest has a lot to do with exploring new territory, off the beaten path: With its uncommon distribution of weight and contrast along its letterforms, it explores a quadrant of design space that is often neglected. Finding the final design often felt a bit like a journey into the unknown. So when Frode Helland of Monokrom, the foundry who published Nordvest, embarked on a trip to the Faroe Islands – a rarely visited place in the “Nordvest” of Europe whose beauty I too had discovered shortly before, but which isn’t known to many travellers — it seemed like a great idea to combine the launch of the typeface with a travelogue that would illuminate some features of these islands, while showing the typeface in use. How did you work your way to finding the right design? I was lucky to get the chance to go back to school to study typeface design at the TypeMedia master program at KABK Den Haag. This two-semester program gave me the time, freedom, and guidance to explore this idea in depth. I spent the first weeks sketching, trying different variants of the (initially quite vague) idea I had in my head, doing some experiments with “reversed” calligraphy too (holding the pen sideways)… it took many iterations and of course the design, and the whole process, benefited greatly from having the eyes and heads of smart and experienced teachers and guest critics on it. When I graduated from TypeMedia, the design was roughly there, but it still took a lot of detail work to make everything really ready for publication. 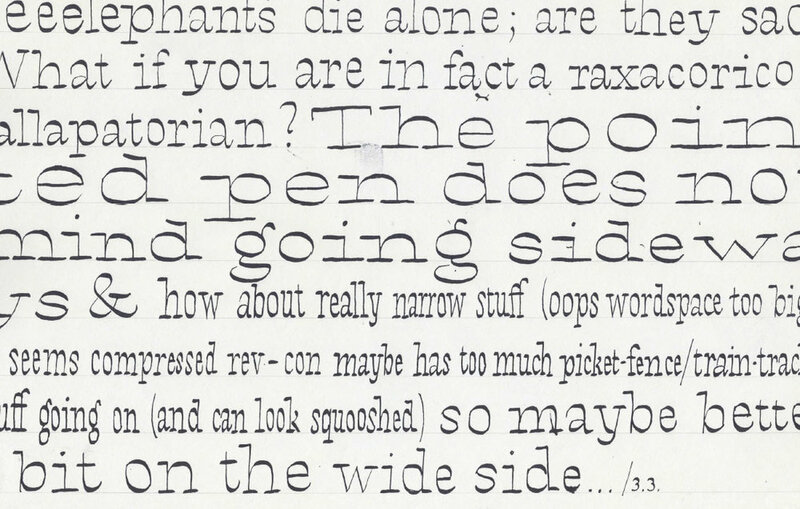 Why did you want to become a typeface designer? It took me a while to find out! I was always interested in letters and text, but for a long time I wasn’t aware that making letters for a living could be an option. I approached the profession in a rather roundabout way, via web design (I studied “multi-media design”) and then working mostly in graphic design and typography. I like to think that I could have had a nice life doing any one of these things too, but when I started learning about type design (at a post-graduate type design class at Zurich University of the Arts) I realized this is exactly what I want to be doing. With its combination of aesthetic and technical challenges, embedded in a larger cultural (and linguistic!) context as well as a stream of rich history, type design tickles my curiosity in multiple ways – and it is a satisfyingly difficult, deep, and complex field. I’m grateful that I could keep searching for this one field of work that truly feels like it wants to be mine. What is your Nr. 1 favourite typeface? A hard question! If I can pick from all of type history, I would have to name Nicholas Jenson’s famous roman book type of 1470. It defined the genre in a way that still is valid today — despite being more than half a millennium old, the way it combines balanced proportions and a certain inspired “life” still make it feel readable, beautiful, and even fresh today.